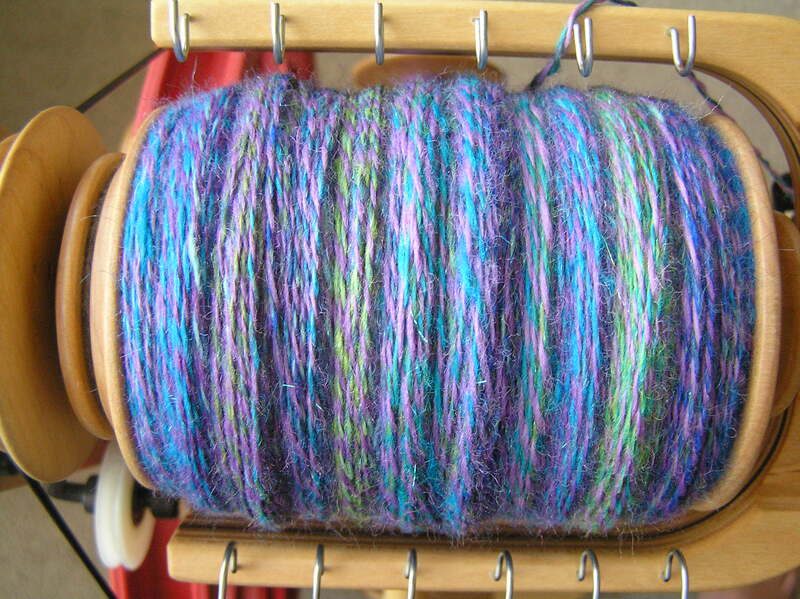 I hand carded some of the the fibres for this about two years ago, long before I had a drum carder. I loved the rich blue/green/purple colour combinations, with just a little angelina included to give some sparkle. When I half-heartedly started knitting a cardigan with the yarn it just didn’t look right. 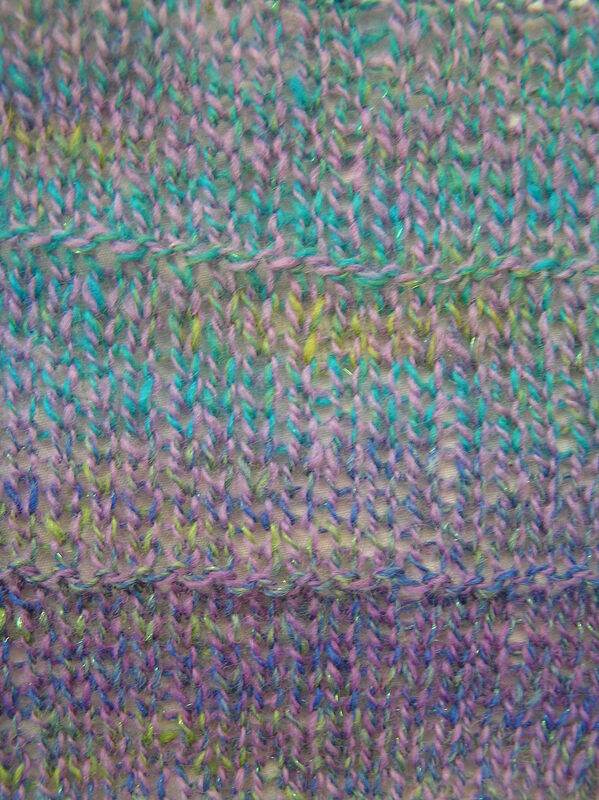 I think plying the multicoloured single with another of plain lilac colour made the resulting yarn lose its bright glow. It has sat in the WIP pile for a long time with only a couple of inches knitted up. 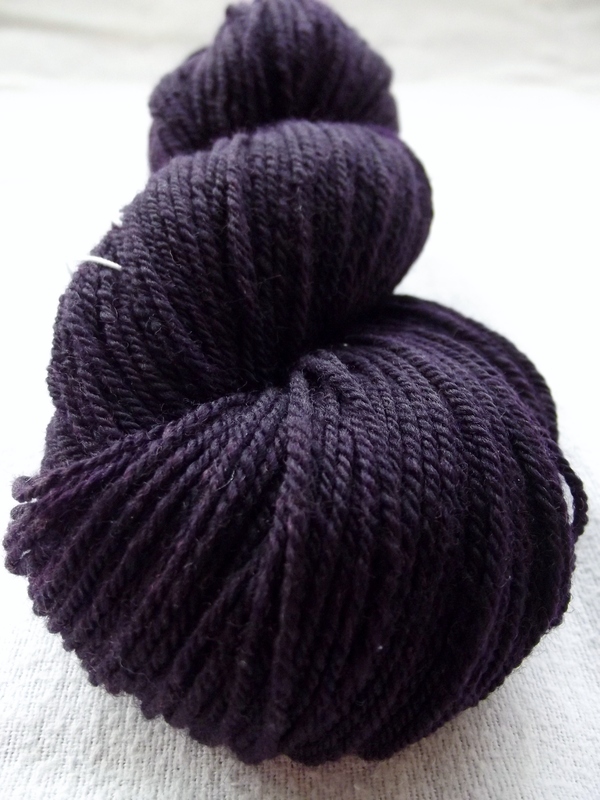 A month or so ago I spun up 100g of aubergine merino from World of Wool to use as the warp yarn. 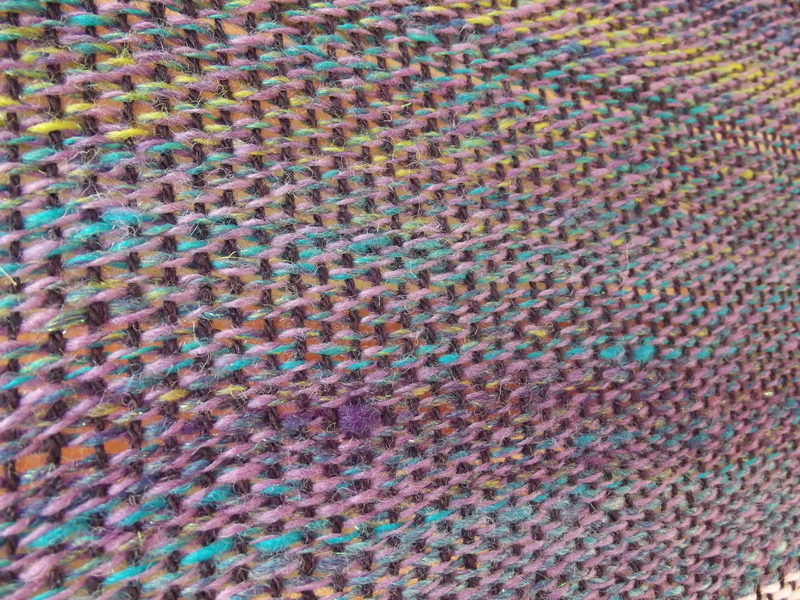 I attempted some maths and figured that I’d just about have enough to create a scarf using the full width of the loom if I used the 5 dent heddle and didn’t make the scarf too long. 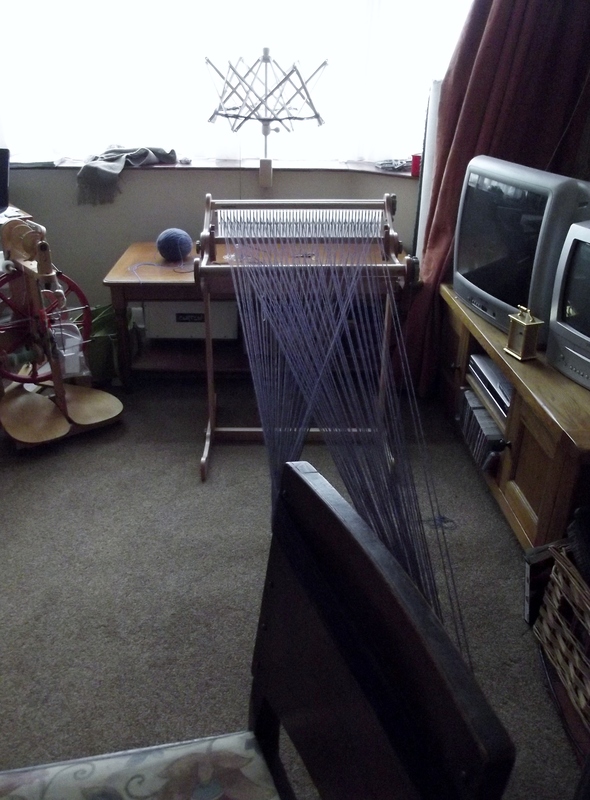 My maths wasn’t too bad, I only had a couple of rounds left on the swift once I’d completed the warp. I tried a different way of fastening the warp threads than I had used in my first project, tieing them directly to the front warp stick rather than knotting them in bunches and then attaching the bunches to the stick. It started well, but after weaving about 5 inches, the tension was all over the place 😦 . I kept trying to convince myself that everything would be fine, it would all look better once it had been washed and finished, but eventually I did what had to be done – ‘unwove’ the scarf, and retied the ends. It made a great deal of difference, so was worth the effort in the end, even if I grumbled to myself for a long time about doing it! 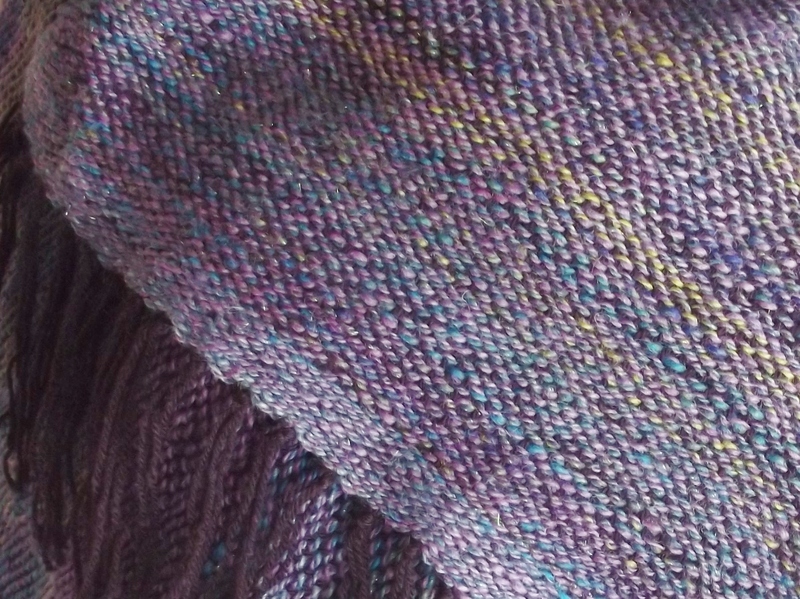 I really like the combination of purple and peacock coloured variagated yarns, the inclusion of a darker purple really changed the appearance of the woven cloth when compared to the knitted fabric. I was sure I would never be interested in weaving. However, I am seeing all sorts of possible projects for yarns I have spun in the past – and it is letting me continue some sort of hobby whilst my knees and fingers are not letting me knit and spin as much as I would like. This entry was posted in Fibre and tagged ashford knitters loom, handspun yarn, weaving. Bookmark the permalink. I love how variegated yarn looks when woven, seeing your work has made me want to get my loom out again but I simply don’t have the time! Weaving is certainly making me look again at lots of fibres and yarns – there’s just never enough time to do all the things you want to!